"Given how much of the matter out of which we formed may have come from other galaxies, we could consider ourselves space travelers or extragalactic immigrants," said Daniel Anglés-Alcázar, a postdoctoral fellow in Northwestern's astrophysics center, CIERA (Center for Interdisciplinary Exploration and Research in Astrophysics), who led the study. "It is likely that much of the Milky Way's matter was in other galaxies before it was kicked out by a powerful wind, traveled across intergalactic space and eventually found its new home in the Milky Way." Professor Claude-André Faucher-Giguère and his research group, along with collaborators from the FIRE ("Feedback In Realistic Environments") project, which he co-leads, had developed sophisticated numerical simulations that produced realistic 3-D models of galaxies, following a galaxy's formation from just after the Big Bang to the present day. Anglés-Alcázar then developed state-of-the-art algorithms to mine this wealth of data and quantify how galaxies acquire matter from the universe. "This study transforms our understanding of how galaxies formed from the Big Bang," said Faucher-Giguère, a co-author of the study and assistant professor of physics and astronomy in the Weinberg College of Arts and Sciences. "What this new mode implies is that up to one-half of the atoms around us—including in the solar system, on Earth and in each one of us—comes not from our own galaxy but from other galaxies, up to one million light years away," he said. "In our simulations, we were able to trace the origins of stars in Milky Way-like galaxies and determine if the star formed from matter endemic to the galaxy itself or if it formed instead from gas previously contained in another galaxy," said Anglés-Alcázar, the study's corresponding author. In a galaxy, stars are bound together: a large collection of stars orbiting a common center of mass. After the Big Bang 14 billion years ago, the universe was filled with a uniform gas—no stars, no galaxies. But there were tiny perturbations in the gas, and these started to grow by force of gravity, eventually forming stars and galaxies. After galaxies formed, each had its own identity. "Our origins are much less local than we previously thought," said Faucher-Giguère, a CIERA member. "This study gives us a sense of how things around us are connected to distant objects in the sky." The simulations were run and analyzed using the National Science Foundation's Extreme Science and Engineering Discovery Environment supercomputing facilities, as well as Northwestern's Quest high-performance computer cluster. 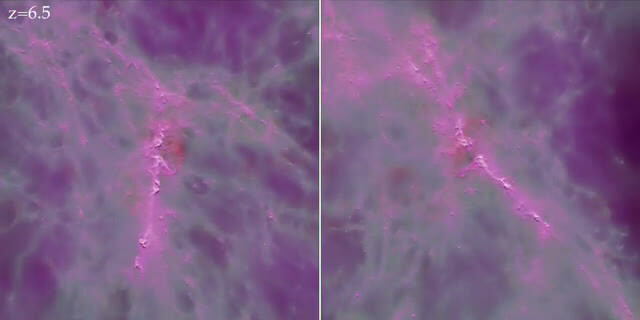 The study is titled "The Cosmic Baryon Cycle and Galaxy Mass Assembly in the FIRE Simulations." 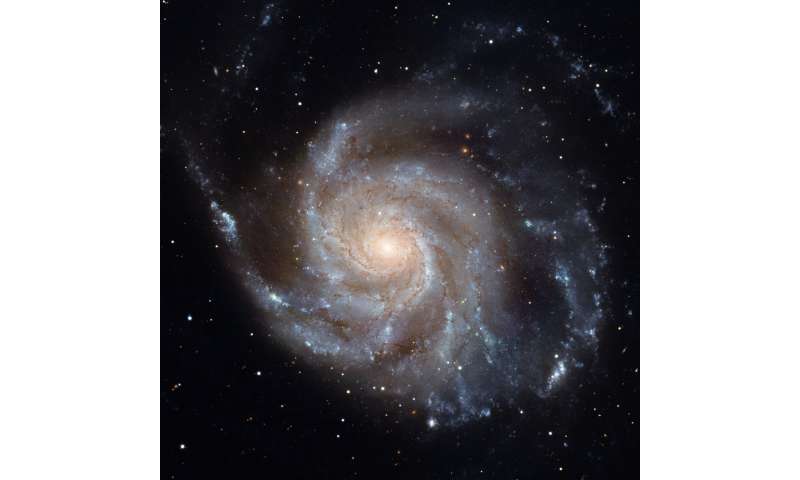 "...up to half of the matter in our Milky Way galaxy may come from distant galaxies." A million light years is only half the distance to Andromeda. Galaxies within that distance are all satellites of ours. Guess it depends on one's idea of "distant galaxies." A million light years is only half the distance to Andromeda. Galaxies within that distance are all satellites of ours. Guess it depends on one's idea of "distant galaxies." @Joel, from the article: Galaxies are far apart from each other, so even though galactic winds propagate at several hundred kilometers per second, this process occurred over several billion years. Schneibo, learn to do some simple math. Andromeda is only 2.5 million light years distance. It was already suspected a decade ago that the VM halo of the two galaxies overlapped one another, this study by Faucher-Giguère simply establishes that fact, that over the course of billions of years that galactic winds traveling at a velocity of several hundred kilometers per second have easily carried REAL detectable matter over that relatively short distance. @Benni: Other than repeating what was already posted in the article, not sure what your point is. At 300km/s, travelling 2.5mly will take 2.5 billion years, so where was Da Schneib wrong? Do you recall my longstanding observations re the universally ubiquitous polar-jet, galactic wind processes effectively *recycling* (de-constructing/re-constructing) and effectively *re-distributing* energy-matter all over the place into deep space, to effectively *re-form* into seemingly *pristine* and *mixed state/metallicity* looking nebulae, streams, stars, stellar-clusters, galaxies/satellite-galaxies/clusters over BILLIONS of years and over the epochs of a continuous eternal/infinite Recycling Universal process? It's good to know, isn't it, that the mainstream astronomers/cosmologists are finding out the obvious that I have been pointing out for so many years while being insulted and called "liar" by so many of the bot-voting troll gang here. Do you think that CS-gang will ever end their denial, and just admit I've been correct all along, on many fronts, both science and behavior? @ Really-Skippy. How you are Cher? I am good, thanks for asking. I think you are fibbing again Skippy. Cher, we all know you don't have the kind of telescope you need to observe those things. You never did have before either. So if you been observing the "ubiquitous polar-jet, galactic wind processes", how you can do that effectively without a telescope? Unless you get a real telescope or a real laboratory it is going to be hard to convince us that you have done any real observing. Oh yeah, I almost forget. It would also help if you went to a real science school before you buy one of those because you need some serious training to know how to use him and know what you are observing too..
"a remark, statement, or comment based on something one has seen, heard, or noticed"
How you like me now Cher? @Ira, not to mention this article isn't about mass ejection from the galactic core but from supernovae in the disk. Says so right in the paper. You must be REALLY obtuse/dishonest not to realize the SUBSTANTIVE WIDER POINT: ALL the ways that de-constructed material is ejected into deep space reaches to reform 'pristine looking' and 'mixed state/metallicity' looking features like nebulae, stars etc etc; as I pointed out happens all over at all scales due to the various 'recycling' processes, of which galactic etc polar 'jets' and supernovae 'winds' are the main ones. No wonder all you are good for is to parrot obvious orthodoxy, DS; you cannot (or will not) CONNECT THE DOTS for yourself; even when I present them all to you on a silver platter! You exhibit everything that is wrong with TOO MANY 'science' theory/journalist HACKS who go along with OTHER HACKS who have run the peer-review and grants/employment system for the closed-shop TWITS/HACKS. 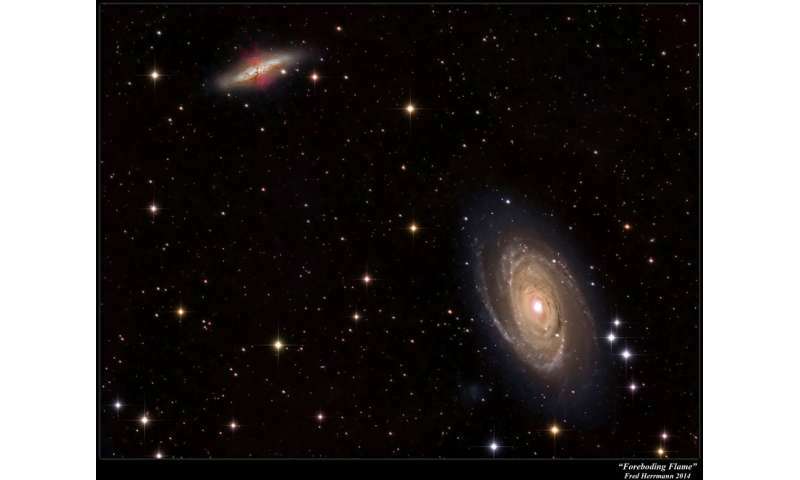 We have observed a total of 1 supernova in the Andromeda galaxy, our nearest neighbor. Glad they used the word "may", because if half the visible matter in our galaxy got here due to SN's from other galaxies...the universe is a lot older than estimated given the time required for that mass to get here and our galaxy to form. Or the SN hypothesis as the spreader of matter is just wrong. - or address implications in your above observations which support Eternal, Infinite, Recycling/Redistributing Universal scenario, NOT the now-falsified BB etc. @ Really-Skippy. How you are Cher? I am good me, thanks for asking. Why you want to drag me into this for? I am not the one who falsified you, you done that all by your own self. Just what it is you want me to see and be fit enough to do? The above observations are already in the early universes theories. You act like that is some great new question that nobody ever thought of before. The professional real scientists (like you are not) answered that question a long time ago and if you were keeping up you would know about that. Why you want to drag me into this for? You "dragged" yourself into it with your first post trolling/insulting etc what you didn't comprehend, Ira. And then @DS "kept dragging you" when he 'rode' on your trolling post to make his own uncomprehending remarks. You two are the "drag buddies" in this instance, Ira. I am not the one who falsified you, you done that all by your own self. Just what it is you want me to see and be fit enough to do? I haven't been "falsified" at all, Ira; either by you or your "drag buddy", DS. So far, you are 'fit for nothing' but bot-voting in ignorance, Ira. The above observations are already in the early universes theories. Yeah Cher you have been falsified all along. You do not have to take my word for it. Ask anybody how you have been proven falsified all along. Everybody you ever argued with on the physorg has falsified you all along. Choot, I bet you can not name one person who says you are not falsified. You just mad because DaSchneib-Skippy falsified your lies you keep telling. And the Captain-Skippy made you mad because he told everybody about you having the criminal records. And Anti-Skippy for falsifying your toes and everything. And me-Skippy for falsifying your pretend scientist laboratory you call the Earthman Playhouse. And a bunch of other Skippys falsified you too but I don't have enough letter spaces to list them all, and it would take about a year to list them even if I did have the spaces. You been falsified every day you ever came here Cher, you been falsified all along. ...an all 'cos a Bot-Voting Ignoramus says so! You're a funny 'twitbot', Ira.